"I chose to study at University of Plymouth because it is located very close to Cornwall, the most beautiful place in England. The University is very good to its students and the excellent teaching resources made me excited as well. The tuition fees were also not so high like some other universities in England. 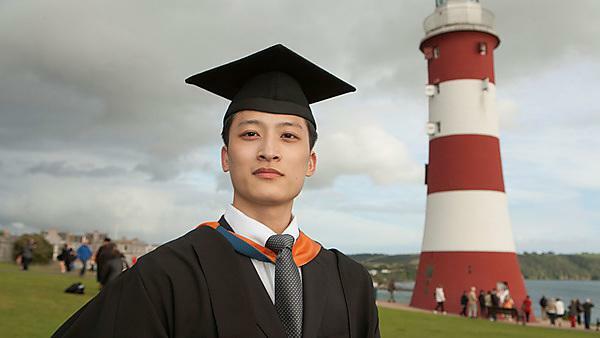 I studied at Shanghai Maritime University for three years before I came to Plymouth for the final year of the course. My major was in Electrical Engineering and Intelligent Control which was quite similar to the final year of the course I was on at Plymouth. I chose electrical and electronic engineering as it provided varieties of electronics, software and different laboratories; this is important for engineering students to get more practical work before starting their career. I learned a lot during my final year project. My supervisor gave me quite a lot of advice and the faculty provided me with discovery boards for the project. You will never regret choosing this course, it will give you a really good chance and the challenge you need. The University is really beautiful, even more so than I originally thought and the course was very good, just as I thought it would be. The only difficulty was that the teaching style is quite different from that in China so it took a bit of getting used to. My friends were really nice and helped me to overcome the hard period. The university provides a variety of choice for accommodation which is very helpful for fresher students. I lived in accommodation with several British students; they taught me a lot about the local culture which was really helpful for me to adjust culturally to life in a new city, new country. The career centre provided a lot of job and CV advice which was very useful and the International Student Advisory Service provided quite useful information on visas, course applications and life services. I joined the university orchestra as a solo player which I enjoyed and I had a good time taking part; I also made more new friends there. Once I graduated from University of Plymouth in the summer of 2013, I chose to further my studies at Loughborough University because I think it is better to learn more – I now study a course in Renewable Energy Technology. The course at Plymouth gave me a good background. Would I recommend undertaking a course with University of Plymouth? Yes of course! The course at Plymouth will provide you with a really good chance and challenge; you will feel the same as me after studying with University of Plymouth."